Celebrating a new year, Belfast Exposed is delighted to announce a solo exhibition of Belfast Exposed Futures Artist Linda Conroy, Breaking the Mould. Celebrating a new year, Belfast Exposed is delighted to announce two new exhibitions, a new group exhibition with photographic works selected from Arts Council Northern Ireland Collection, curated by Deirdre Robb and Mirjami Schuppert, and a solo exhibition of Belfast Exposed Futures Artist Linda Conroy, Breaking the Mould. Belfast Exposed Futures artist Linda Conroy has taken the Church and identity as a source of inspiration for her playful and subversive work Breaking The Mould. Throughout the exhibition everything we encounter is slightly disrupted or interrupted in some way. 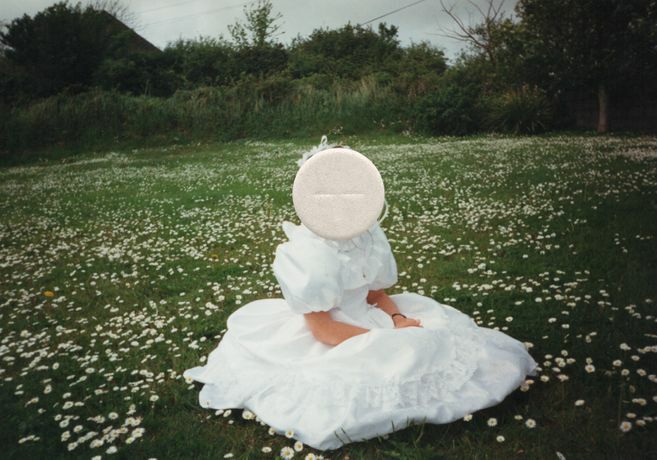 As a starting point to these interventions Conroy utilizes individual formal photographs of a recognizable church ceremony. The work raises questions around the continued participation in key religious events by non-practicing members, highlighting some of the more commercial and seemingly superficial aspects of this engagement. At the same time, within the work there is evidence of a society intertwined with its religion. Here there is recognition given to the more nuanced relationships that exist between people, tradition and their cultural identity. In this vein, further exploring these complexities Conroy playfully manipulates sacred material to her own means, blurring the lines between the absurd and the precious. The sculptural pieces and the installation form a surprise element of the exhibition. At Belfast Exposed, we are investing in the new generation of photographers. Established in 2015, Belfast Exposed Futures is the name given to the learning programmes that aims to make photography accessible to people from every community, perspective and ability. Belfast Exposed Futures is a dedicated programme supporting new photographic talent in Northern Ireland. The main outputs of the programme support education development, providing skills, mentorship and training opportunities and future career development for emerging artists in photography.